I Have An iPad, So Why Did I Order A Kindle? I love getting emails from Amazon telling me that my order has shipped! An almost giddy feeling wells up inside me when I see the message. The most recent email was about an Amazon Kindle that slowly made its way to my doorstep. I was perfectly happy using my iPad as an ebook reader until I handled the Kindle that I bought my wife for Christmas. That’s all it took. So what change my mind? When I first received my iPad six months ago, I was immediately struck by its sleek design, its thin profile, and its amazing video quality. I still am, especially when compared to a laptop. It’s a handy device that I regularly use in my consulting business. As an ebook reader, the iPad is found lacking. Sure iBook has some neat, page turning graphics, but the lack of titles is frustrating. The Kindle Reader app works well on the iPad but the software cannot overcome the relative heftiness of the iPad. It’s not a joy to hold upright while reading in bed. It’s much heavier and bulkier than a Kindle. Although I occasionally find the backlit screen of the iPad to be an advantage in low light situations, generally speaking the eInk technology of the Kindle provides a far superior reading experience. Many claim that the technology is easier on the eyes. I don’t really know whether that’s true. I just know that it seems more pleasurable to read on the Kindle than the iPad. When Kindle 1.0 came out, a couple of my early adopter friends quickly snatched one up. They were excited to show me how great it was. Frankly, I wasn’t impressed. The flickering and slow page turning was enough to turn me off. A couple of versions later, Amazon has gotten it right. This little device is smaller, lighter, and faster than its predecessors. It’s battery life is extraordinary. As a light weight, near laptop replacement device, the iPad is wonderful. I use it in business meetings, I use it to make presentations at conferences, and I use it to just surf the web from the comfort of my recliner. But there’s something to be said for doing one thing really well. Sometimes, I just want to read. I’m glad my Kindle has arrived. Wishing you a very Merry Christmas and a Blessed New Year. “Quitting smoking is easy; I’ve done it dozens of times.” the great American writer Mark Twain once said. Although I’ve never been a smoker, I can relate to Twain’s sentiment. Setting a goal for yourself can be easy. If taken lightly, goal setting can be little more than creating a wish list of things you’d like to achieve in the future. However, the value of setting goals really is in defining your priorities and outlining a way to achieve the goals. This helps you to systematically live life in a way that is consistent with your priorities. It’s the follow through and dedication required to turn the wish into a reality that’s tough. Almost a year ago, I shared my goals for 2010 with the blogosphere as a part of a meme that was going around at the time. Now it’s time to reflect on how I did this year. Without a time of reflection, setting goals becomes a spark in a flash pan, a short burst of thought and enthusiasm without any real long-term commitment. Periodically reflecting on your goals helps to ensure that 1) the goals are still applicable, and 2) that you are making strides toward achieving the goals. I also accomplished some other noteworthy items in 2010 that were not on my radar at the start of the year. Foremost in this list would be an addition to our family. We now have five kids so as you can imagine, that alone keeps us quite busy. I also became a BSA Certified LifeGuard during the summer. (Now I have a fall back plan just in case this whole database and business thing doesn’t work out for me. 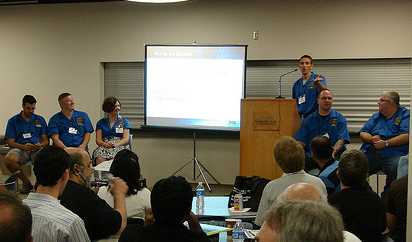 <grin>) And I helped orchestrate a successful SQLSaturday in Nashville by serving as the Chairperson for the event. I’m typically my harshest critic when it comes to performance. There’s always something I could have done better. Overall, despite falling a bit short on some of my goals for 2010, it was a good year and I’m pleased with the accomplishments. So how about you? How did you do with your goals this year? Blog your review and post a link to it in the comments below. Kevin Kline (twitter, blog) and Tim Ford (twitter, blog), you guys both called me out for the meme last January so I’m specifically interested to hear how you faired with your goals. Think you know SQL Server past and present? Here are the next-to-impossible questions I asked at the SQLSaturday #51 Stump The Experts session in Nashville. There were a few people who apparently have far more active brain cells than me who managed to answer a couple of these questions. But for the most part, these questions, did indeed, stump the experts. True or False. The following T-SQL statement is valid. What’s the maximum number of nonclustered indexes per table for a 64-bit instance of SQL Server 2008 R2? There was a little known and cancelled upgrade to Windows 95 that eventually became known as Windows Desktop Update, Internet Explorer 4.0. What was its codename? For what processors was SQL Server 4.21a SP4 available? When did Mainstream Support end for SQL Server 2000 Enterprise Edition? What is the maximum number of columns you can have in a single SELECT statement in a 64-bit instance of SQL Server 2008 R2? What was the final name of the SQL Server feature that originally was known by the code name Rosetta? What command displays information about the installed versions and registered instances of Notification Services? How many task in SSIS for SQL Server 2008 R2 are designed for SSAS? On what operating systems did SQL Server 4.20 run? How many copies of a query plan can be in memory at one time in SQL Server 2008 R2? In how many different North American cities has the PASS Community Summit been held? Name one aspect of SQL Server that separate it from any other Microsoft product. For which operating system was SQL Server originally developed? In SQL Server 2008 R2, how many DMVs are related to Indexes? How much was an unlimited user license for SQL Server 1.1? When was SQL Server 1.1 released? When SQL Server 1.1 was first released, it was considered to be well behind in sales compared to Oracle Server for OS/2. How many licenses had Oracle sold already? True or False. SQL CE can be managed from SQL Server Management Studio 2005. When AUTO_UPDATE_STATISTICS is ON, updated statistics or cardinality changes to which of the follow tables cause a recompile? So how did you do? Got any other good trivia questions that I could have / should have added to the list? And a very special thanks to our panel of experts – Thomas LaRock, Jason Strate, Kendra Little, Jeremiah Peschka, Louis Davidson, and Kevin Boles! Most of the time, I live under a rock when it comes to pop culture. I’ve never seen a single episode of Survivor, 24, or House. I don’t know which megastar is getting married to what professional athlete. And I can’t name a single song from Lady Gaga. In fact, I didn’t even know that name until a few months ago. It’s not that I feel above those things; it’s just that they hold exactly zero interest for me. And it doesn’t bother me that I don’t know these things. I’m used to being completely unaware when others bring up those topics. I’d much rather watch the History Channel, learn a new Dutch Oven recipe, or mend a fence in the pasture. So I wasn’t surprised when I’d never heard of a book that a friend recommended to me about a year ago. That happens with some regularity. But since then I’ve slowly realized that I have apparently been living under a literary classics rock too when it comes to Atlas Shrugged by Ayn Rand. It seems that most everyone I know has read it at least once. Most agree that it’s a good book and worth the sizable time commitment required to finish its 800-plus pages. From what I understand through talking with others, the book is eerily similar to many of today’s political events and remarkably parallels our current economic challenges. All the more astonishing is that the book was written over 50 years ago! A couple of weeks ago I tweeted my intention to finally read Rand’s most famous prose. About a half dozen Twitter friends are going to read it as well. Some have read it before, others haven’t. Some I know personally; others I’ve just met. Together we’re going commit to reading a couple of chapters per week and discussing it 140 characters at a time. We’ll use the Twitter hashtag #JohnGalt. Our first virtual, Twitter-based book club meeting is Monday, the 26th of July. There is no specific time. We’ll just tweet comments and questions throughout the day as we have time. In fact, I’d expect the asynchronous discussion to last a few days. If you’d like to join us, tune into the Twitter feed. We’d love to have you.